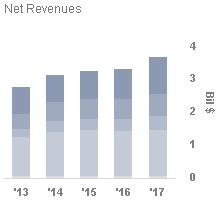 TD Ameritrade (NASDAQ: AMTD) has seen its revenue grow at a CAGR of 7% and its stock price tripled between 2013 and 2017. The company has seen a significant growth in its interest earning assets, supported by the Fed’s interest rate hikes over the last few years. The company’s focus on client engagement and advisory services has helped it expand its customer and asset base and consequently led to a significant growth in investment product fees. Trading revenues have witnessed some pressure due to declines in revenue per trade amid rising competition from traditional and discount brokerages. The U.S. brokerage incumbents have been facing headwinds in recent years, amid reduced trading volumes and intense competition between full-service brokerages and discount brokerages. With low margins, acquisitions seem to have become the go-to strategy for large brokerages. Ameritrade’s acquisition of Scottrade in 2016 led to a significant increase in its customer and asset base. Our price estimate for Ameritrade’s stock stands at $47, which is below the market price. We expect the company’s overall revenues to grow by nearly 20% in 2018. Our interactive dashboard shows the historical trends and our expectations for the company’s FY’18 top line; you can modify the key value drivers to see how they impact the company’s results. The company generates around 45% of its revenue from this segment. We believe the 9% annual growth in interest earning revenues since 2013 is primarily attributable to the rate hikes over the last few years. The company’s yield on these assets, at 1.5% which is relatively low in comparison to competing brokerages, was a slight deterrent to the revenue growth. We believe the 14% annual growth in investment product fees is primarily due to increase in customers seeking financial advice supported by technology-driven insights. The company has continued to cater to the demand for innovative financial products in order to suit customer needs. It launched a digital advisory platform in 2017, which is expected to have boosted the growth in the revenue from this segment. The company generates around 40% of revenue from trading commissions. With continuous competition from discount brokerage in terms of pricing and subdued macro conditions during the earlier years, the company saw restricted growth in its trading commissions. Despite an 8% annual growth in volumes since 2013, revenues grew by just 4% annually owing to 4% annual decline in revenue per trade.